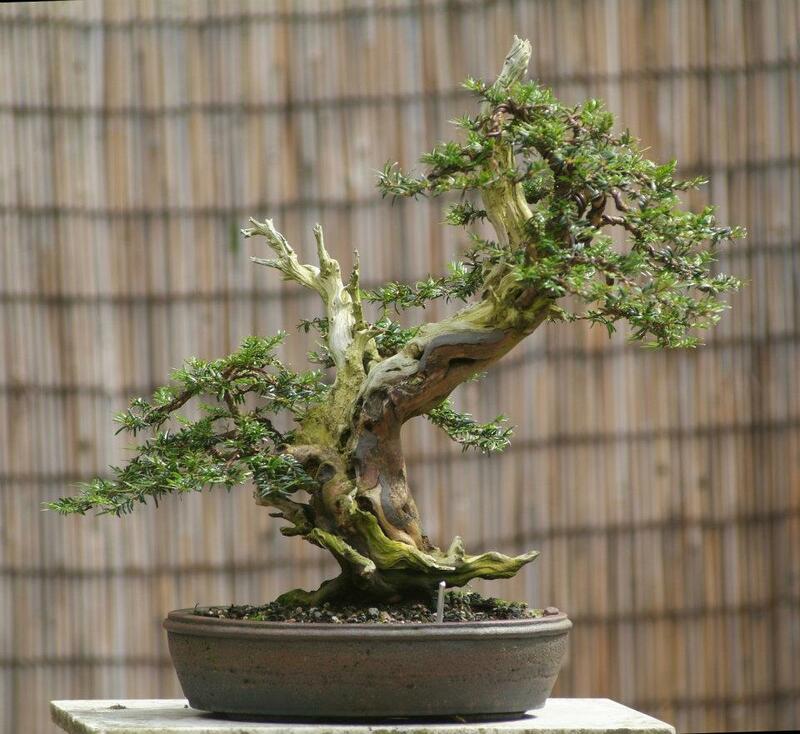 In the dark depths of my memory I remember a phrase spoken by another artist during a lecture/demo… “Create the smallest Bonsai possible with the material you have” … and lets face it BONSAI are supposed to be small trees. 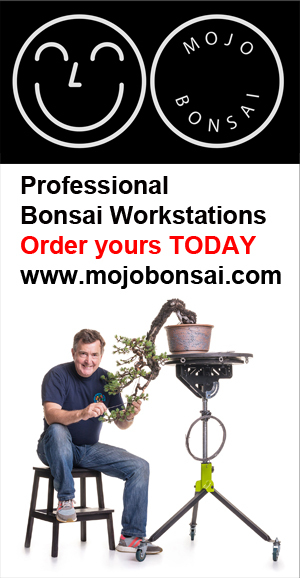 Despite the plethora of large trees being shown in major exhibitions I have noticed an upsurge in ‘small’ bonsai… Note the recent major Shohin exhibition here in the UK and the growth of the British Shohin Association over the last few years. Certainly many artists of my generation (and older) suffer from ‘Bad backs’ due to carrying over large bonsai. Many large bonsai do possess drama and ‘presence’ but so do small trees… AND I believe that small trees are more challenging, far more attention to detail and a delicate touch is required. 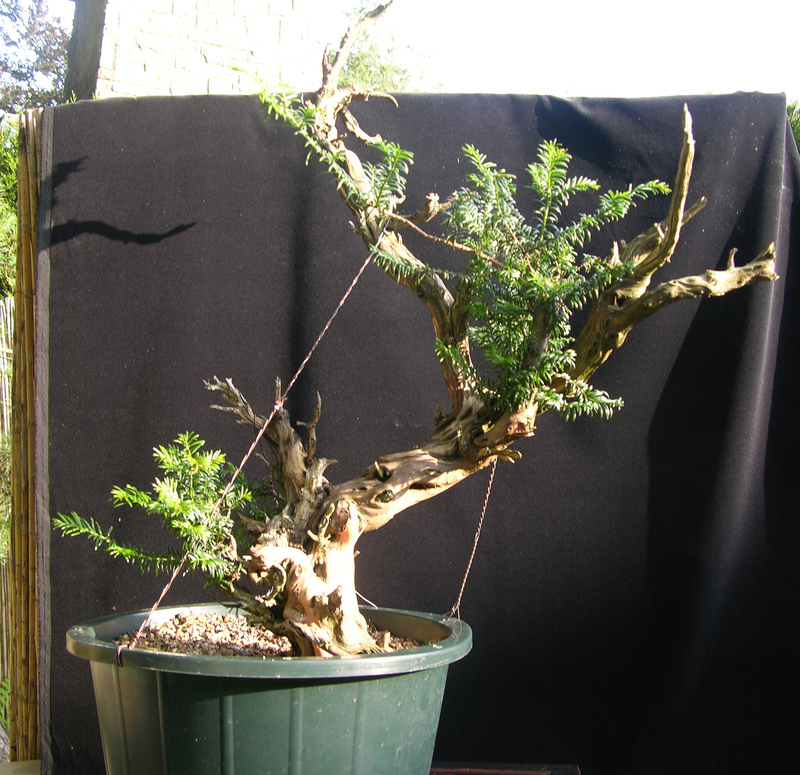 I have just styled this ‘Kifu’ Taxus. When the tree was collected from the cliff face it was over 1.5 metres in height and a double trunk. 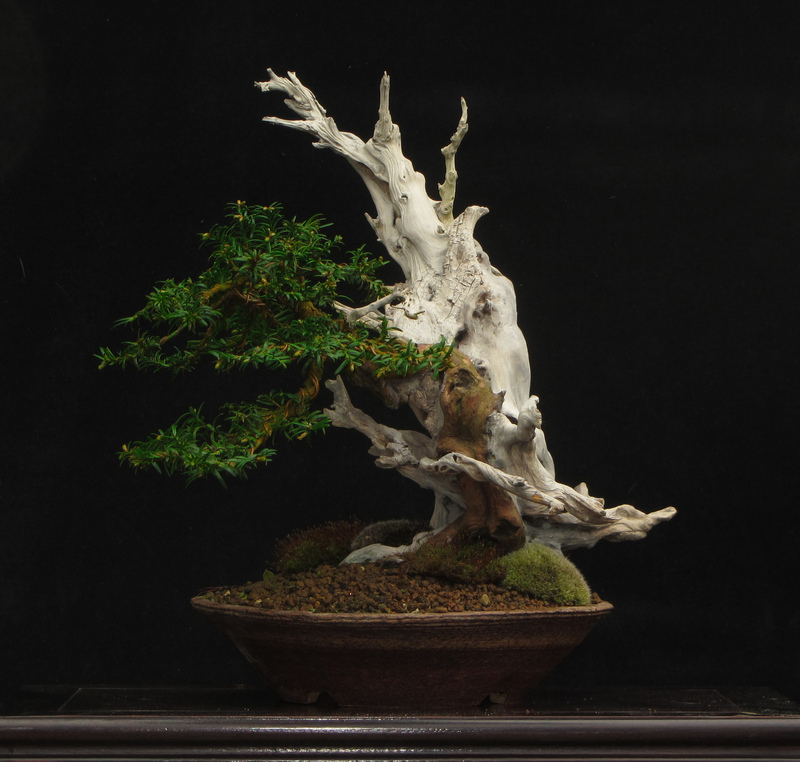 The original idea was a Chuhin size but the fascinating area around the nebari and a twisting live vein leading to a strong branch enabled this tree to become a Kifu size bonsai. It is planted in a lovey circular pot by Milan Klika. After seeing this in the flesh all I can say is wow. As nice as it is on the picture its nothing compared to being up close and personal. Thanks Tony for a great day out last Sunday and for a great price on a great tree. Fantastic. I understand the love of chuhin and larger sized bonsai, but the shohin and mame really do it for me. It just seems that a miniaturized tree should be as miniature as possible. Goede keus Tony. Je hebt nu een mooie grote, kleine boom. Verhouding is erg goed. Incredible outcome. What is the overall height? Did you air layer the other branch to make a second tree? In my limited view it was far too developed to through it out. A magnificent and courageous choice. I think that most people had chosen to keep the big branch on the right. Looks nice now. Reminds me of a tree for Bodirama…that went the same transformation. Show Us your smallest bonsai, please.